If you think about it, even for just a minute or two, you’ll see that this was not my doing. After all, I’m the one that suggested we take a break after we lost our dog last week. I was the voice of reason. But then things started happening. First, without a dog in the house, it suddenly became clear just how much food Clay drops on the floor. He takes heaping handfuls of pretzels or chips, much more than he can hold, then leaves trails of food throughout the house. He is also a master of what we call the “bite and toss,” an odd compulsion where he flings the last quarter inch or so of a french fry or apple slice or chicken nugget indiscriminately. It’s a miracle no one has lost an eye. Clearly, we needed another dog for housecleaning purposes. I couldn’t very well let the house be overrun with ants, could I? Second, the last few years, my wife has been talking about how she would like a basset hound. And she wanted to name it Cosmo. For her sake, and just because I needed a quick break from work, I happened to take a peek at a basset hound rescue Web site last week. Just a peek. Just a break. For my wife. Not looking for a dog or anything. 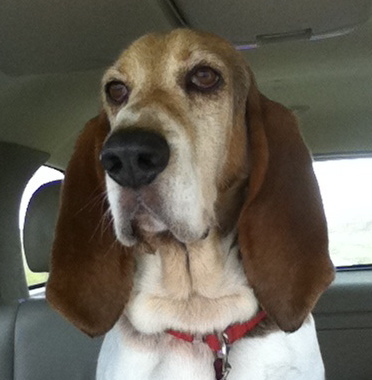 Darned if there isn’t a six-year-old basset named Cosmo in need of a home. He is looking at me from the Web with those droopy ears and sad brown eyes. Did I mention his name is Cosmo? What are the odds? Really. I ask you. I couldn’t keep that to myself. Right? So, after a good 10 or 15 seconds of deliberation, I called my wife’s attention to the rescue site, and, forces were set in motion. Powerful forces beyond any one person’s control. Applications were filled out. E-mails were exchanged. Phone calls were made. Turns out Cosmo was already adopted, but the rescue organization had just the dog for us. Six years old. Was found tied to a tree in North Carolina, half starved, suffering from heart worm. Had endured an endless trip up the East Coast, rejected by one rescue group after another. Now he was healthy, and looking for a permanent home. Listen to that story. No one can resist that story. Oh, and by the way, here is his picture. Look at this picture. You can’t say no to this picture. Nobody could say no to this picture. Am I right? We asked our older son. He said, sure, let’s get him. We showed the pictures to Clay to see what he thought. “So cute and sweet,” he typed. “Should we give him a home?” my wife asked. The family had spoken. You can’t argue with that. Forces were in motion. Powerful forces. So, I’m headed on a two-hour drive Friday morning to a foster home beside the mighty Susquehanna River to pick up our new family member. You see this wasn’t my doing? I was just a pulled along by a powerful tide? Right? You see that now? If you happen to talk to my wife and want to point that out to her, please feel free. She seems to think this was my idea all along. I’ve been the voice of reason. Right? 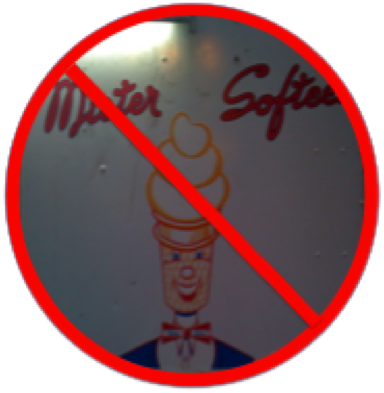 Mr. Softee photo credit: Bundy’s World. Attribution. This entry was posted on November 3, 2010, 12:48 pm and is filed under Communicating, Daily Life, Silly Behaviors. You can follow any responses to this entry through RSS 2.0. You can leave a response, or trackback from your own site. No, he’s on floor clean-up duty. Recycle, baby!